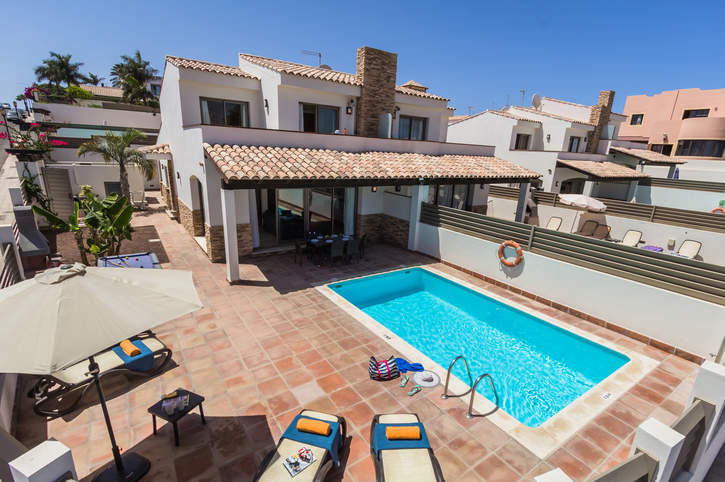 Villa Jenny is a delightful 3 bedroom villa located in the heart of Corralejo. The property is a stones' throw away from the shops, bars and restaurants this much-loved resort has to offer. There are beaches in the centre a short walk away, with Waikiki being the closest one, 5 minutes on foot. The villa is contemporary and stylishly decorated, plus has its own private pool. What's not to love? Air conditioning/heating in the bedrooms, pool heating and WiFi are included. A contemporary villa located in the heart of Corralejo. A fantastic villa in a fantastic central location! The outside area is spacious and has a private pool, with sunbeds to one side. There is a shaded terrace housing a dining table and chairs - perfect for alfresco dining during the day or on warm evenings. At the side of the villa is also a garden area, planted with subtropical plants and flowers. From the road, a gate opens onto the pathway leading to the front door. There is on street parking for your hire car. The open plan lounge/dining area is spacious and thanks to the patio doors opening onto the pool terrace, is also flooded with a natural light. There are comfortable sofas, a flat screen TV and an impressive wooden dining table and chairs. The well-equipped and contemporary kitchen is adjacent and has an access to the utility room. There is a twin bedroom with an en suite shower room on the ground floor. The remaining 2 bedrooms - a twin and double - are located on the first floor and both share the facilities of the separate bathroom. Both bedrooms have access to the shared terrace and the double bedroom also has a private terrace too. Villa Jenny is in residential area with restaurants and supermarkets just a stone's throw away. Less than 10 minutes' walk away are the beaches of Waikiki and Galera, as well as Las Palmeras shopping centre which has many shops, bars and cafes. What's more, the fantastic beach of Grandes Playas and spectacular sand dunes are 10 minutes' drive away. Our Villas Ola, Sirena, Nanda, Pino, Juliana and Sapphire are on the same street. There are shops a few minutes' walk from the villa with the Las Palmeras Shopping Centre less than 10 minutes' away on foot which offers high street fashion, designer shops and cafes. Or, there is also the El Campanario Shopping Centre which has a more traditional feel with live music while you shop, 20 minutes' walk away. On Tuesdays and Fridays there is a local market there. The bars and restaurants are just a stone's throw away from Villa Jenny where you can enjoy lunch at one of the tapas bars which have typical local food from the island and cater for everyone's taste. Or by night enjoy the live music venues and eateries near Waikiki Beach with views out to the ocean. At Corralejo Harbour you will find good quality local restaurants. Many of restaurants offer home delivery should you wish to stay in. Waikiki Beach is the closest to Villa Jenny, 5 minutes' walk away. There is the sandy beach of Galera a little bit further away and of course the stunning beach of Grandes Playas, 10 minutes' drive away. You will be spoilt for choice as Fuerteventura claims to have the best beaches in the Canary Islands! Acua Waterpark in Corralejo offers a variety of water slides and tubes or you may choose to venture into the wave pool or the lazy river! You can even try your hand at crazy golf which is also located at the Acua Waterpark. There are ferries from Corralejo Harbour to the neighbouring island of Lanzarote. Why not spend a day in Playa Blanca and visit Europe's first underwater museum 'Museo Atlantico Lanzarote'? The Mirador de Lobos Golf Resort in Corralejo is the closest one to Villa Jenny. Alternatively, there are other golf courses in Caleta de Fuste located on the East Coast just after the airport. Fuerteventura is popular with different types of water sports. Transparent clean water, virgin beaches and a moderate climate are great for windsurfing, snorkelling, kayaking and catamaran sailing. Villa Jenny is not available to book for season as it is sold out. Take a look here at the Fuerteventura villas that are currently on sale. Stayed at this row of villas a number of times and always had a great time. This time was no exception. Location is superb, a short walk to beach and shops. Villa very well equipped and pool a welcome break from the hot weather! Extra outside space in villa Jenny an added bonus. All in all a fabulous holiday - no doubt we will return again soon! The villa was very nice. We have stayed in Villa Jenny three times and find it fantastic. Looking foward to the next stay in 2017! Villa Jenny was a lovely place to stay, we would definitely stay again. All six of us enjoyed our holiday at the villa very much. Fabulous time. Heated pool a major bonus. My husband and I had an amazing time at Villa Jenny in Fuerteventura. the villa was amazing, beyond expectations! We struggled to fault this villa, everything was perfect, it was clean, modern, had pretty much everything you need plus more and in a great location. Stayed at Villa Jenny several times and my latest visit was as great as the first! 1st class as always. This time we had WiFi which is a welcome service thank you. We will be back again next Christmas. Amazing location. It was so central, yet really quiet. The facilities and equipment were all top spec. The Villa was better than we could have ever hoped. Infact, the pictures looked excellent but did not do the villa justice. The villa was very clean and we recieved a great welcome pack on arrival. The villa is in an ideal location, far enough away from any noise but also close enough that we could walk in to town and to the beach at ease. Overall, brilliant! Way above our expectations, the photos of villa Jenny don't do the villa enough justice.......We will be booking the villa again next year!